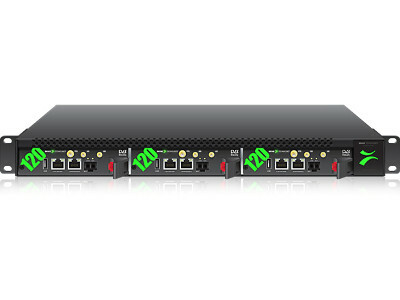 VB120 BROADCAST PROBE is a realtime monitoring platform with applications in any network where digital video is carried across IP infrastructure. The VB120 probe hardware is custom designed and built to telco-grade standards for maximum reliability and minimum maintenance. Each VB120 blade consumes less than 12W of power. This drastically cuts on power consumption and air conditioning needs in installations. The VB220 can be paired with a full set of interface blades to cover signal formats such as DVB-T/T2, DVB-S/S2, DVB-C/C2, QAM-B, 8VSB and ASI. The ability to continuously measure all your media services makes the VB120 invaluable for confidence monitoring, thus facilitating a more rapid network expansion. In addition the VB120 can do deep analysis of the broadcast signal reducing the need to travel to remote locations when changes in the system is done or to find the reason behind alarms. The VB120 BROADCAST PROBE comprises a fully fledged ETSI TR 101 290 monitoring engine used to monitor enabled inputs, one monitoring engine per input working in parallel. The basic VB120 monitors DVB ASI, IP monitoring is enabled through the IP Monitoring and Analysis option and RF inputs may be included by adding demodulator blades to the system. Each Bridgetech ETSI TR 101 290 engine performs Priority 1, 2 and 3 measurements in addition to monitoring vital CA parameters, CA monitoring being of vital importance as CAS errors may lead to equally severe impairments as ETSI TR 101 290 Priority 1 errors. The monitoring engine may also be configured to check signal scrambling. PSI/SI and PSIP tables are analysed and presented as table summary and hex dump, the latter enabling analysis of proprietary descriptors. Bit-rates are measured at TS, service and PID level, and the ETSI TR 101 290 engine also monitors RF parameters for optional demodulator inputs. Fully configurable round-robin functionality enables sequential monitoring of several transport streams per monitoring engine. More details in the ETR290 pages. The innovative RDP technology (Return Data Path) that comes as standard on the VB120 enables easy re-routing of remote signals from regional locations into a central location for decryption and advanced signal analysis. RDP reduces the need for truck rolls and otherwise necessary on-site visits by skilled and expensive engineers. The VB120 recording functionality allows alarm triggered or manually initiated recordings from any enabled input. The VB120 has been designed to support all modern encapsulation standards including ISO/IEC13818-1 Transport Streams and MFRTP. The VB120 continuously measures signal loss, packet loss and packet jitter. These vital parameters are presented through Bridgetech's own patented MediaWindow™ technology. MediaWindow™ allows for current and historical data to be displayed in an intuitive and visual way for easy understanding of the media flows in an IP network. Alarm handling is one of the main tasks of the VB120 BROADCAST PROBE, and all measurements are checked against user defined thresholds for alarm generation. A sophisticated threshold template system gives the user full alarm handling control at probe, TS, service and PID level, ensuring that only relevant alarms are displayed. Management and control for the basic VB120 is available through a separate 10/100/1000-T Ethernet interface, the IP-enabled VB120 may alternatively be managed in-band through the 10/100/1000-T video interface or through the SFP video interface. Standalone access is achieved through the use of any standard modern web browser, avoiding the need for a dedicated client application. With SNMP trapping and the comprehensive Eii™ (External Integration Interface) XML export the VB120 BROADCAST PROBE is easily integrated into existing NMS systems either directly or through the optional VBC Controller Server (VBC).